Definition at line 38 of file counter.hpp. Definition at line 41 of file counter.hpp. Definition at line 44 of file counter.hpp. Definition at line 56 of file counter.hpp. Definition at line 64 of file counter.hpp. Definition at line 70 of file counter.hpp. 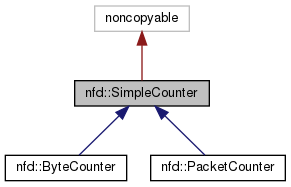 Referenced by operator rep(), nfd::PacketCounter::operator++(), nfd::ByteCounter::operator+=(), and set().